We recently demonstrated the strong potential of using dual-dynamic transformation models when tackling deformable image registration problems involving large anatomical differences. Dual-dynamic transformation models employ two moving grids instead of the common single moving grid for the target image (and single fixed grid for the source image). We previously employed powerful optimization algorithms to make use of the additional flexibility offered by a dual-dynamic transformation model with good results, directly obtaining insight into the trade-off between important registration objectives as a result of taking a multi-objective approach to optimization. 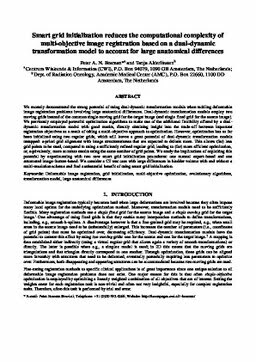 However, optimization has so far been initialized using two regular grids, which still leaves a great potential of dual-dynamic transformation models untapped: a-priori grid alignment with image structures/areas that are expected to deform more. This allows (far) less grid points to be used, compared to using a sufficiently refined regular grid, leading to (far) more efficient optimization, or, equivalently, more accurate results using the same number of grid points. We study the implications of exploiting this potential by experimenting with two new smart grid initialization procedures: one manual expert-based and one automated image-feature-based. We consider a CT test case with large differences in bladder volume with and without a multi-resolution scheme and find a substantial benefit of using smart grid initialization.